music and times.” It was 2012, his album ‘America’ was just about to drop and he was lighting up audiences all around the country with his high energy, one-man show of synthesized noise-pop and crowd pleasing antics as seen in the video below. Deacon started out in 2003 and since then has released 8 albums. All an intricate mixture of beats and tones, electronically produced through a wide array of devices. He usually employs a computer to generate digital beats and to stream live recordings. Over this he runs his keyboard effects through a complex series of rack mounted gear and effects pedals, as on the 60 minute release, ‘Goose on the Loose’, where he processed a Wavetek 180 signal generator through a Digitech Wammy and then a Line 6 DL4. Amongst all this gear you will almost certainly find a pedal from Moog, which makes him the perfect candidate to play MoogFest this year. 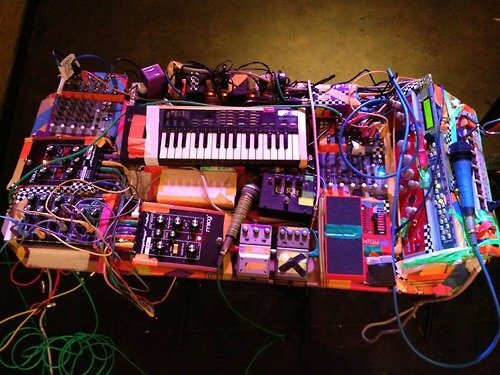 Moog Fest is a 5 day festival in Asheville, North Carolina that started in 2004. It is a multistage festival that brings in bands that work with the instruments and pedals created by Moog. Besides Dan Deacon, this year you will find M.I.A., Giorgio Moroder, Yacht, Pet Shop Boys and many more acts. In addition, there is a daily schedule that includes panels and conversations and workshops. The festival starts today, so if you’re in the area, have fun. For the rest of us, we’ll have to keep our eyes out for videos of any performances. And another of him playing around with 2 Moog Minitaurs, 2 MF-107 Freq-Boxes, MF-103 Phasers and a pair of CP-251 Control Processors. A hefty dose of Moog displayed as only Dan can!